I know it's August, but I'm already picking out the boots I want to wear this fall. 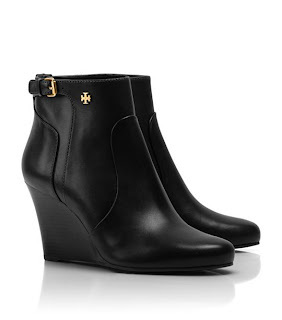 I think Tory Burch nailed it with these Milan Wedge Booties - I love everything about them. They're pretty pricey, but extremely fabulous. The black and the brown are just beautiful! What's your favorite type of boot for the fall? I'm not into wedges, but I love a boot with heel and feminine buckle around the top portion. I love the tan pair!! Sooooo cute! I love booties. I don't even want to know how much they cost! I already know they are out of budget but I have some in a similar style. I'm obsessed with the brown booties!! I definitely need to buy me some cute booties like these for Fall/Winter!! and your banner is really cool, btw. Thanks for stopping by my blog, would you like to follow each other?